Ask fellow campers about "Lorne C Henderson Conservation Area" and nearby attractions. The registration kiosk was closed and it was self registration, but no forms or envelopes for payment to be placed in the "iron ranger". I found out from a seasonal camper that there seems to be a "relaxed attitude" among park employees. I wasn't that worried because I had already reserved a spot and paid for it. The park is divided into sections with seasonals in one, at the beginning of the campground and mostly overnighters in another, at the end. Our electric and water site was a fairly level, good crushed gravel pull-through. There was a heavy rain downpour during the night and our site had drained off the water while others had puddles everywhere. It was a bit tight for turning onto the pad due to a few trees that were too close. However, with the trees and grass surrounding the pad, it was fairly private. The utilities were placed midway and worked out well with our rig. Both water and electric worked fine. There are three dump stations in the park. Two of them are on the main road and the other near the shower house. An unpainted table and fire ring were on site as well. I picked up 3 Canadian OTA TV channels and a few American ones as well. The Wi-Fi didn't work from this far away, only near the bathrooms and showers. Down our way, we only had port-a-potty toilets. Being in a nature area, it was certainly quiet here at our end of the campground. For that reason I would consider staying here again. 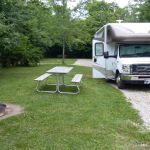 We camped at Lorne C Henderson Conservation Area in a Motorhome. The town of Petrolia is nearby and the Victorian era buildings are a reminder when this place was the oil capital of Canada. Down the road is Oil Springs where the first oil discovery in Canada happened. Both places have museums and displays of the oil fields and the equipment used. Are you affiliated with Lorne C Henderson Conservation Area ?